The WordPress White Screen of Death (WSOD) is a frustrating phenomenon. When it happens, everything stops. Your site is replaced with a blank, white screen, and you can’t log in. What makes this error even more troublesome is the complete lack of any errors messages when it occurs, making it a nightmare to troubleshoot. In this post, I’ll walk you through four of the most common causes for the WSOD and their solutions. 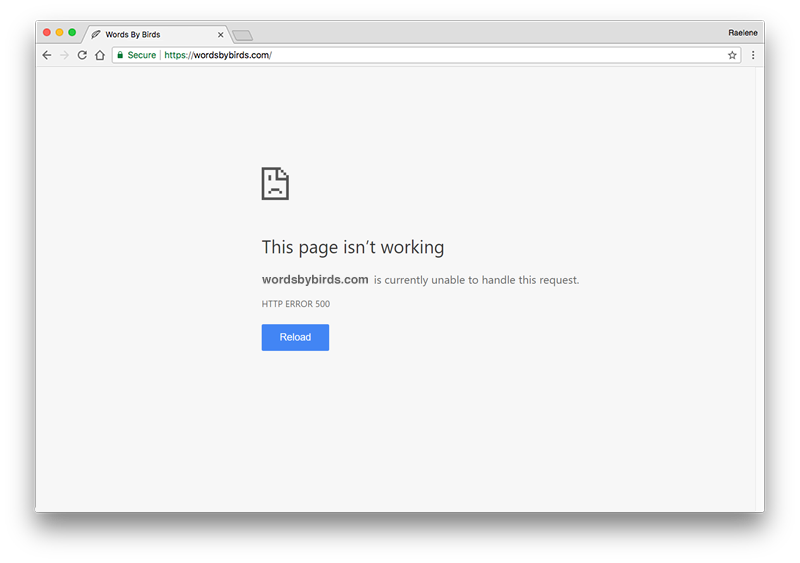 What Causes the WordPress White Screen of Death? The so-called WordPress white screen of death is a simple shorthand for a significant error on your WordPress website. Essentially, some error has occurred that interferes with your website’s ability to properly read and load its code. An example of the WordPress white screen of death on Chrome. The error manifests as a white screen; your website, for some reason, fails to load. This white screen could vary from browser to browser (Chrome, for example, may offer some kind of generic error code, such as a 500 error), but the basic result is the same. The WordPress white screen of death can be caused by several issues. But it all boils down to this: if your website was working before and you get WSOD now, something changed. The trick to fixing the WordPress WSOD is figuring out what changed and correcting the issue. When you’re getting started, it’s important to remember this piece of advice above all: don’t panic. Flailing blindly can cause more trouble than you know what to do with. No website is perfect, and eventually every webpage is going to run into trouble. It happens. Knowing that the white screen of death is easily fixable can help you stay calm and make solid decisions to get your website up and running again. Because WordPress is an incredibly popular content management system, users and administrators are incredibly varied. That’s why we’re breaking down our diagnostic and solution advice into two categories: Easy and Pro. The first thing you should do is check your plugins. It’s not always the most common reason for a WordPress WSOD, but it is among the easiest to diagnose and resolve. Navigate to the Plugins in the WordPress admin and deactivate all of your plugins. Deactivate all of your plugins at once. In a separate tab, refresh your website. If your website reappears, you know that one of your plugins was causing the WSOD issue. One by one, re-activate each plugin. Refresh your website after each plugin has been enabled until the WSOD appears again. At that point you’ll have found the plugin causing the issue. Keep that plugin deactivated until you’ve reached out to the plugin’s developer to see about a fix. Pro: If you don’t have access to your WordPress admin, you can still check your plugins, but it’s a little more complicated and you won’t have the benefit of a CMS. In order to deactivate all of your plugins, you’ll have to work with cPanel or log in via FTP. Using your FTP access, simply rename all of the plugin folders. If your website comes back up, properly rename the plugin folders one by one until you’ve found the one causing the trouble. If you don’t have access to your plugins via the WordPress admin, try accessing your site via FTP. Insufficient memory is one of the most common reasons why you might see the WordPress white screen of death. That’s because most WordPress websites are given a default memory limit of 32MB. These days, it’s not uncommon for websites to easily exceed that. Doing so takes a bit of a detour into code. Easy: Unfortunately, there is no truly easy way to increase your website’s memory, as this cannot be performed within the WordPress CMS. If you don’t know your way around FTP clients or file managers, call your developer or ask a friend! Save your change and refresh your website to see if this solved the issue. If this does not solve your WSOD, there are two potential issues that might be occurring. Either you need more memory still (in which case, it might be worth looking into which plugins might be consuming an inordinate amount of memory) or you’ll need to talk to your server admin or web host for more help. The next possible cause of your WordPress WSOD troubles might just be your theme. All WordPress websites have some kind of theme. Sometimes your theme will be pre-made from a template. Some websites have custom themes created for specific clients or purposes. Go to Appearances > Themes. Change your website’s theme to one of WordPress’s default options, such as Twenty Seventeen. Activate a default WordPress theme, such as Twenty Seventeen, to check that you’re not experiencing a theme conflict. In a separate browser tab, refresh your website. If your website appears in the new theme, then your old theme was the cause of your WSOD issues. A quick note: your website in a new theme might look quite broken, especially if you were using a custom theme. 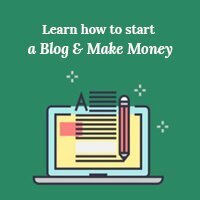 Once you have established the theme as the cause of your WSOD issues, you need to determine exactly what may have changed between when your site was working and when the white screen of death first appeared. Pro: If you are unable to access your website’s WordPress admin panel, you may need to again use an FTP client or file service. The easiest way to do this is to simply rename your “Themes” folder. Can’t access the WordPress admin? Log in via FTP instead. 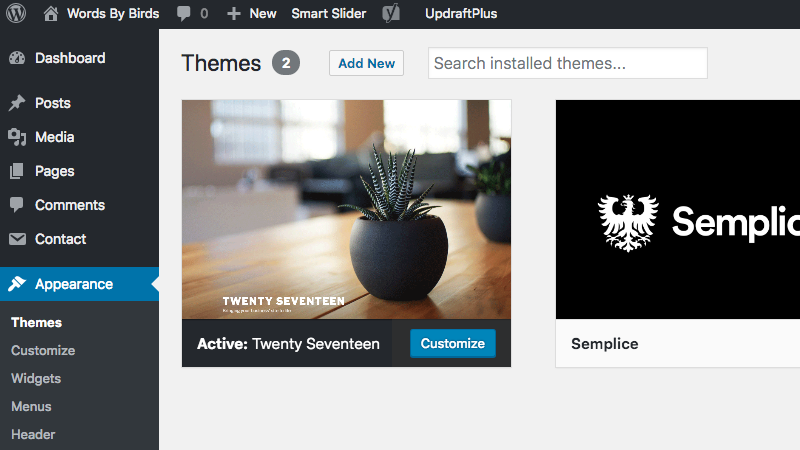 When WordPress is unable to find that renamed folder, it will replace your theme with a default one. If the theme is the problem, you should be able to refresh your website and see the white screen of death is gone. Most developers are going to have at least two versions of their website: a live version and a production/staging version. The live version is what users see. The production version is the “working” version where you make updates to code before pushing to the live website. When changes are made to the live website before being tested in a production environment, a mistake as simple as a misplaced semicolon can cause a WordPress white screen of death. Easy: Call your developer and ask him or her to reset your website to a previous version. If you were the one that was working on the live version of the site, it will be helpful to recall the changes you were working on before the site went down. One of the reasons why the WordPress white screen of death is such a troubling issue is because it’s difficult to tell what’s causing it. It can be disconcerting when your entire website goes down and you don’t know why. Knowing how to fix the WordPress white screen of death – beginning with diagnosing the issue – can help get you on track towards fixing the issue. Have you experienced the white screen of death? What did you do to fix it? If you have any questions about troubleshooting WSOD, let us know in the comments below! I’ve found that this issue is caused by something in the htaccess file almost every time, at least for me. Some plugin or other does something to the htaccess and breaks it, so I just delete it and let WordPress rebuild it from scratch. Might not be a feasible solution for everyone, but it works for me!